CONGRATULATIONS TO CARRIE FROM LIVE, LEARN AND LOVE TOGETHER! Y'all are such fun friends! We have a token system in place for our video game and computer time. The boys must read 30 minutes to earn a token that awards them 30 minutes of game time. However, there is one game that I don't mind bending the rules and giving them FREE time for--- the 3D virtual world created by the folks at JumpStart.com. While I was familiar with the JumpStart computer games for toddlers and elementary aged kids, I was excited to find that they had launched a browser-based virtual world for kids 3-10 years old. 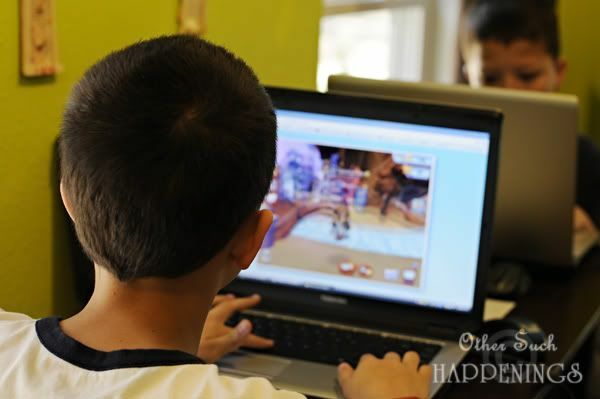 It's an online system that is safe, educational and FUN, even for my boys that are used to the excitement and gameplay of the Wii and Xbox 360. My boys have also enjoyed creating their own Jumpee. 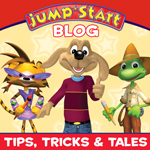 A Jumpee is their own personal character that they have created to use on the site. They get to choose their Jumpee's facial features, clothing, accessories, artwork and even pets! When I was little, we had Space Armada and Burgertime on our Intellivision System III. Technology has sure come a long way! Austin and Noah are 11 and 9yo. JumpStart also has areas aimed at the younger set, such as StoryLand for 3-5 year olds, AdventureLand and MarineLand designed for K-2nd, and FutureLand which is geared towards 3rd-5th grade. You can see and read more about this at the JumpStart blog. JumpStart.com would like to give one of y'all a free three month membership! I'll random.org a winner on Tuesday, November 23rd. Fave childhood board game: Candyland and Stratego (obviously at different ages!). Video game: the aforementioned Burger Time and Pac-Man. Video Game: Don't have one. Disclosure: I was provided with a JumpStart membership at no cost by Knowledge Adventure in order to test the products’ abilities and give my own personal opinions on it. The opinions I have given are mine and may differ from others but were not influenced by the company or the free product provided. I'm not entering ye ol' giveaway because we already have a jumpstart.com membership. We've had one for a while. It actually even counts towards Ben's school hours with his school. I love it and he loves it. He's learned a lot of math from it. Board game-Sorry!and yahtzee. Pardon the typing. In bed on iPhone. Getting ready to read an iBook. My favorite game when I was little was Hide and Seek. We played it when we went to see our cousins who lived 6 hours away. We thought it was SO much fun! I'd love for my kids to be able to try this out! My favorite game as a kid was hide & seek or Uno. On the playground: Red Rover! I loved playing hopscotch with my dad. I remember when he taught me and remember him trying to help me be cordinated enough to jump with the right foot at the right time. I think I liked this game so mcuh because such a special man taught me. Thank you for jogging my memory. Oh my kiddos would love that! Favorite game as a kid, ummmm.... how about Uno, or card games with my gram. Or Aggrivation and Monopoly with my cousins. BTW I think you have two games combined, unless you really played it like that. We played freeze tag and the only way to get unfrozen was to crawl between the legs. And then we also played cartoon tag in which the only way to keep from being tagged was to sit and shout out a cartoon. So many to choose from! We played board games like Clue and Sorry, but I remember when the first Nintendo came out. That was a BIG deal! My all time favorite game (that I found out about during Bible school) is Dutch Blitz. We still play it, and we teach it to other families when ever we get the chance! I loved playing chinese checkers, but I have to say I remember the original nintendo Super Mario Brothers! I have very fond memories of summer long Monopoly tournaments with my sister and Christopher, the boy across the street. Chris, who was a couple of years older than we were, would walk to 7 Eleven first and load up on Slurpees and candy galore. We'd play for hours and then write down where all the pieces were each night so we could set up and continue the next day. We also played some great games of Hide and Seek with all the neighborhood kids. This was S. FL, and banana plants at dusk make for fabulous hiding. Another favorite thing to do outdoors was have seagrape fights. We divided into teams, filled newspaper bags from older siblings' paper routes with seagrapes, and GO! How fun! I was a huge fan of freeze tag outside...and of Monopoly and Risk inside. We have this now and would really like 3 more months free. My favorite game was "Life" board game. I used to love playing "Cloak and Dagger" (got it's name from the movie, but didn't really have anything to do with it) with our neighbors. We would divide up in teams and each hide something in the neighborhood. The first team to find the other team's treasure won. I loved Monopoly and was given a British (?) version (same game, different locations) which made it an even cooler game to play. On the playground I enjoyed tether ball and dodge ball except when I got smacked w/the ball. I've managed to avoid getting hooked on any games on my iPhone, but that could change since I recently realized how cool it is to be able to read the Internet on my phone. Yep, a little late w/the pleasure. I know my son would enjoy building.